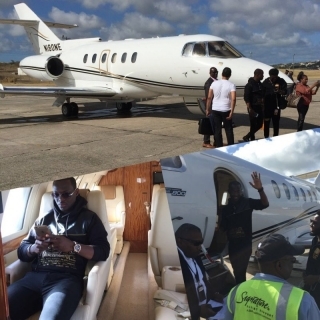 A church based in Canada has presented a private jet to its Ghanaian pastor on his birthday. The church, Miracle Arena for All Nations in Canada, which is a multi-cultural charismatic and a fastest growing church based in the heart of Toronto, Canada was founded in 2011 by Dr. Kofi and Rev. JoAnne Danso. On his birthday, the church presented the private jet to Dr. Danso and his wife for their passion and charisma towards the work of God. In an interview with Prophet Dr. Danso, he noted that he had prophesied that God was going to bless him with a jet this year on his birthday and so was not too surprised when the church bought him one. Prophet Danso said it feels good to have a private jet because it will ease his travels, adding that it will also help reach more souls with the word of God. The Ghanaian pastor stressed that the private jet was not a thing of luxury, but rather a necessity. According to him, the jet will be used to generate funds for the church when not in use by way of leasing it out. He advised other churches to emulate the example of his followers. “Every church should do this for their pastors if they can. The more we help pastors to reach one continent or the other we help fulfill the gospel,” Prophet Danso noted. Prophet Danso has lived in Amsterdam for nine years and migrated to Canada for five years. He is married with four kids, including a set of twins. He has been in the ministry for 24 years and has 15 books to his credit.